In Sept 2018, NETSPay rolled out a new upgrade to allow the citizens of Singapore make e-payments when they travel overseas. Thanks to UnionPay-NETS partnership. For the first time, NETS services will be available outside Singapore. NETS is Singapore’s leading payments solution provider. And UnionPay is the Global network for payments. Under this partnership, NETS has signed an agreement to allow customers from Singapore pay for purchases overseas. To do this, customers will need to use NETSPay app at merchants that support UnionPay’s QR Code platform. Also see how QR Code payments are being used worldwide. The partnership came as a result of a recent survey. It ranked NETSPay as one of the three most frequently used mobile wallet apps in Singapore. Also, NETS always looks forward for ways to make cashless payments seamless. The NETSPay app has been updated. It will allow consumers to scan a QR Code to process their transactions. This will be possible at more than 7.5 million UnionPay merchants worldwide. NETSPay customers with NFC enabled smartphones will be able to make contactless payments too. It will be possible to do this at nearly 12 Million UnionPay QuickPass contactless acceptance points. Further, the enhanced NETSPay will also offer many new features. Users will also be able to send or receive money from NETSPay users via mobile number or a QR Code. So, the ones willing to send gifts to family or friends will be able to send e-angbaos. Or you can say, electronic red packets. This is one out of many ways how Singapore is using QR Codes. 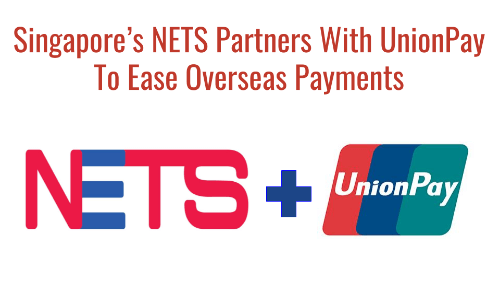 That’s all you need to know about UnionPay-NETS partnership.